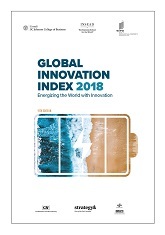 The GII theme this year is “Energizing the World with Innovation.” Access to energy is a prerequisite for improving standards of living, economic development and – in the context of the Global Innovation Index – a necessary ingredient to innovation. It is estimated that by 2050 the world will require twice as much energy as it needs today, including in regions that currently have no access to energy sources or energy networks. At the same time, current approaches to energy supply are unsustainable and the need to reduce emissions requires a shift towards cleaner and more efficient methods to produce energy through traditional sources as well as to ramp up the use of renewable sources. The GII 2018 analyses the energy innovation landscape of the next decade and identify possible new technological breakthroughs and innovative approaches along with their sources at the country, region, or firm level. The GII 2018 also explores innovations in energy production, energy storage, energy transport and distribution, and energy consumption.